The Joint Program Executive Office for Chemical and Biological Defense (JPEO-CBD), Joint Project Manager Nuclear Biological Chemical Contamination Avoidance (JPMNBCCA) and the Edgewood Chemical and Biological Center (ECBC) Detection Branch is requesting responses from industry on their willingness to participate with ECBC and JPMNBCCA in a multi-day technology review and nondestructive testing. ECBC has developed an innovative algorithm known as Agents of Biological Origin Identifier (ABOid). The ABOid algorithm can analyze mass spectra signatures and provide a microbial identification and classification output. Results are color-coded to highlight anything that could be considered a pathogen and whether it is toxic. For sequenced organisms, ABOid is capable of providing strain level identification, which is significant in that one can then reveal important diagnostic information for medical countermeasures. ECBC and JPMNBCCA are interested in determining the portability of commercial mass spectrometers to be interfaced with ECBC’s ABOid Algorithm for microbial detection and identification. The limited 1-3 day testing would encompass industry coming to ECBC with their candidate Mass Spectrometers to collect spectra on pre-prepared biological samples. The spectral outputs from the systems would then be analyzed using ECBC’s ABOid Algorithm for microbial identification. Information resulting from the tests will be used to optimize the Mass Spectrometer performance and interface requirements, as well as the ECBC’s ABOid algorithm. Results from the test will also guide future overall acquisition strategies. The JPMNBCCA has currently fielded the Joint Portal Shield (JPS), a fixed site biological warfare detection and identification system to multiple military bases in South Korea and the Middle East. 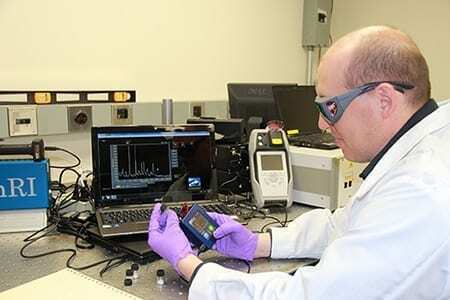 The JPS is a networked system that can detect and identify up to ten biological warfare agents in less than 25 minutes. The JPS sensor is housed within Tricon shipping containers that provide commercial power and environmental conditioning. The JPMNBCCA is considering replacing the JPS sensor with a Biological Mass Spectrometer working in conjunction with the ABOid algorithm. This new system could be housed in the existing JPS Tricon, leveraging existing infrastructure and communications. Further details are available via Solicitation Number: W911SRBIOMASSSPECRFI.